Meet your new favourite travel companion, the ultra-slim, fully connected COOLPIX S9500. With the versatility of a 22x zoom super-telephoto lens, the superb image quality of an 18.1-megapixel low-light CMOS sensor and the extreme convenience of built-in Wi-Fi® and GPS, capturing and sharing the sights and sounds of your trip has never been easier. Shoot a stunning panorama landscape, then instantly share it—along with the exact location it was shot—to your compatible smartphone or tablet. When you get home, explore your photos and videos on an interactive map and relive the adventure step by step, shot after shot. The COOLPIX S9500 makes it easier than ever to share beautiful views of your world. Take a great shot and instantly send it to your compatible smartphone, tablet, or any compatible Wi-Fi® device. Then use your smart device to email it, text it, or upload it to your favourite social networking or photo album sites—share it the same way you normally share online. Your friends and family will be amazed by the shots you share! Relive the excitement of your travels in a whole new way. The COOLPIX S9500 records the exact location of each shot you take, so you can follow the path of your adventure and every stunning view along the way! Share your photo journeys on Google Earth™, Google+™ and other social media sites, or with the included Nikon View NX2 software. Built-in mapping and Electronic Compass also helps you navigate unfamiliar destinations, and Points of Interest (POI) show you nearby photo-ops like scenic lookouts and historic landmarks. 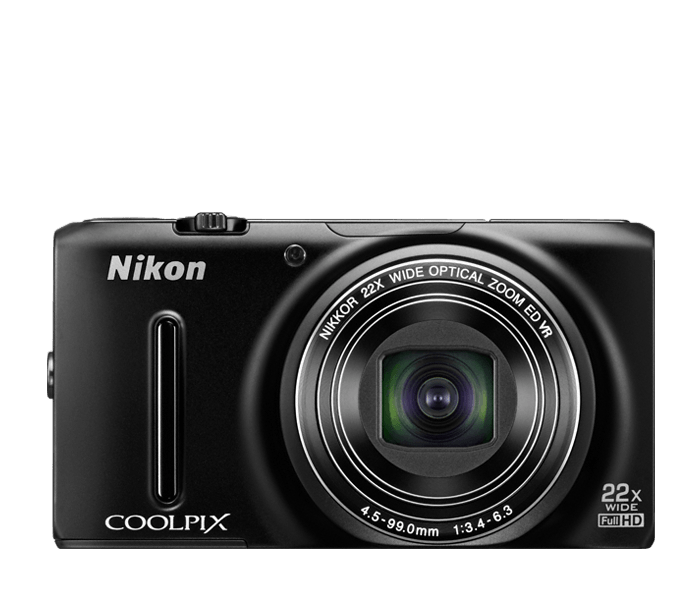 The COOLPIX S9500 is the ultimate travel companion! Imagine being able to shoot without a flash at weddings, concerts, parties—anywhere your flash normally fires. You won't have to interrupt a moment to capture it, and your photos and HD videos will look more natural and true to your memory. The COOLPIX S9500 performs so well in low light situations that, in most cases, using the flash is optional. Of course, when the lighting is extremely poor and you need a flash, it'll be there. Form and function can play nicely together, and the COOLPIX S9500 is proof. Ultra-thin and lightweight, it fits comfortably in your pocket or purse. But you won't want to hide it there—every time you pull out the COOLPIX S9500, you can expect someone to comment on its good looks. Consider it a stylish accessory for your already fashionable life. Compose, review and share your photos and Full HD videos on a vibrant, high-resolution 3.0-inch 614,000-dot OLED display. Faced with an amazing panoramic view? Simply turn on Easy Panorama mode and start panning the camera. The COOLPIX S9500 will automatically record a series of shots and then stitch them together into one incredible, seamless panoramic photo. Based on Camera and Imaging Products Association (CIPA) standards for measuring the life of camera batteries. Measured at 23(-/+2)°C; zoom adjusted with each shot, flash fired with every other shot, image quality set to Normal, image size set to 4896x 3672 (18.1MP). Battery life may vary depending on shooting interval and length of time menus and images are displayed.